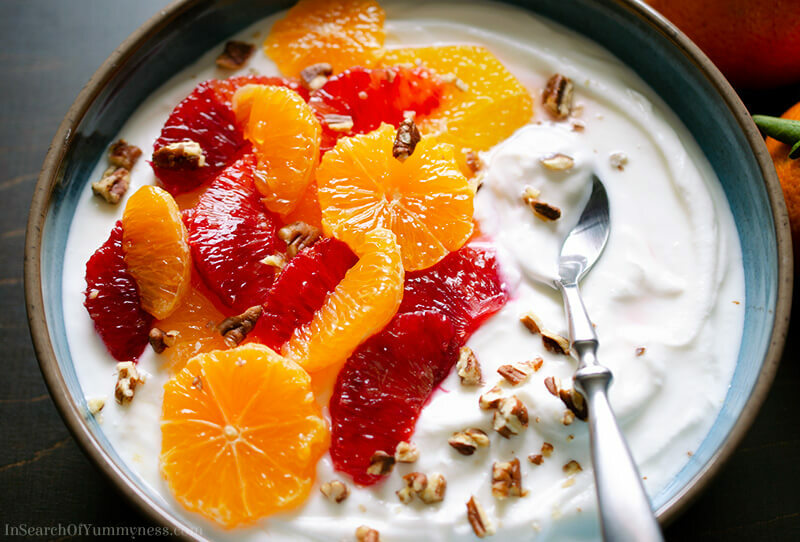 Add some brightness to your morning with this healthy winter citrus yogurt bowl recipe. This article also has tips on managing pre-diabetes. “Can you put sour things on yogurt?” my friend asked at dinner the other night. We were looking at a photo of this winter citrus yogurt bowl on my phone, while we (not so patiently) waited for the waitress to take our orders. He was concerned that the sour fruit would curdle the yogurt, the way lemon juice affects milk. I honestly had a similar thought the first time I saw citrus on a yogurt parfait. I’ve often added fresh berries to yogurt in the summer months, but the sourness of citrus paired with the tang of yogurt wasn’t something that I thought I would enjoy. It was only when I found myself in the (somewhat awful) coffee shop at my previous job, starving at 8:30am having left the house on an empty stomach 2 hours before, that I decided to give it a shot. I bought an overpriced plastic cup of yogurt with 3 slices of clementines, a sprinkling of granola and 2 pecan halves and went back to my desk. Maybe it was the starvation, or my low blood sugar, that affected my response to this new breakfast pairing. I’ll never know. But I can tell you that citrus on yogurt is delicious! What’s in the Winter Citrus Yogurt Bowl? You really don’t need instructions for this recipe (but I’ve provided them below anyhow). I just layered slices of oranges with supremes of blood oranges and clementines on top of Greek yogurt. There’s a sprinkling of chopped toasted pecans on there too. I wanted to add pomegranate seeds, but gave up after failing to find them at 3 different grocery stores. If you can find some though, it would probably be very tasty. 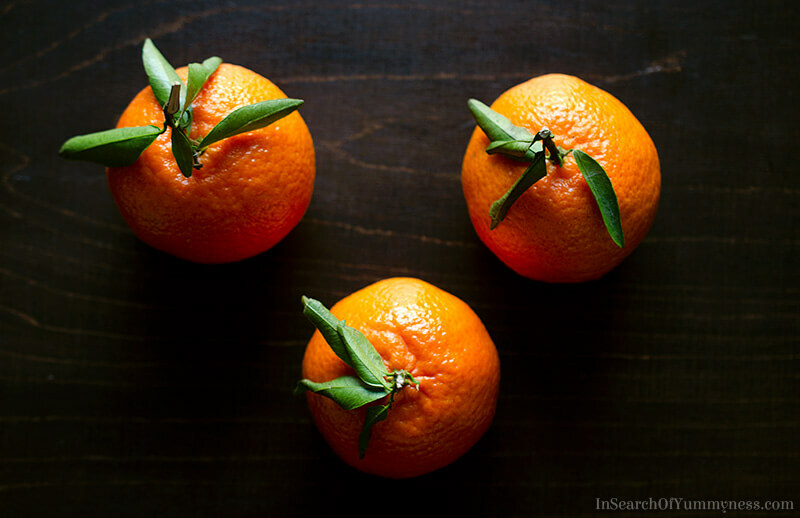 If you don’t know how to supreme citrus fruits, there’s a handy tutorial over on Martha Stewart’s website. If you’d rather not go through all the fuss, you could just peel and segment the fruits instead. Now, the “healthiness” of this winter citrus yogurt bowl recipe depends entirely on what yogurt you choose to use. As much as I love full-fat flavoured yogurts, I’ve come to realize that they are too rich to be a part of my regular breakfast routine. For example, one of my favourite yogurts is Liberté’s Coconut 9% yogurt, which is made from milk and cream. It’s super creamy, and very sweet. I shouldn’t have been surprised when I finally read the nutrition label and discovered that I was eating 10g of saturated fat and 22g of sugar for a 3/4 cup portion. For someone who is pre-diabetic, that’s far too much sugar and fat to be eaten daily. So instead I’ve switched to Liberté’s plain sweetened 2% yogurt, which has 2g of saturated fat and 13g of sugar for the same portion size. It’s these kind of changes that have helped me manage my pre-diabetes since I was diagnosed last year. I’m happy to be able to say that I’ve improved my A1c number! While I’m still at-risk for developing type 2 diabetes, getting my blood test results back has proved to me that diet and lifestyle changes actually do make a difference. I’m going to share what has been working for me, in case it’s helpful to anyone else. BUT! I do have to remind you that I’m not a doctor, or a medical professional of any kind, and you should always talk to your doctor before making any changes to your lifestyle or diet. This was a surprisingly easy change to make, for the most part. I started paying attention to the sugar content in what I was drinking, and quickly realized that I could cut down my sugar intake by avoiding, or reducing the amount of those drinks that I was consuming. Now I treat bubble tea and fancy coffee shop drinks as an occasional indulgence. I’ll opt for a tea latte instead of a frappucino, and I always order the smallest size available. If I’m having store-bought lemonade at home, I’ll pour a half-portion instead of a full cup. Most of the time, I drink water, or tea without sugar to keep myself hydrated without sky-rocketing my blood sugar. As much as I love food, and cooking, and feeding others, I’m also human. I get fed up of making dinner. I am sometimes too lazy to cook something for my lunch. I’ve been known to skip breakfast from time to time (less often these days). In these cases, I’d just grab fast food and call it a day. It’s just so easy! Until you think about the consequences of putting that much salt, fat and sugar into your diet on a regular basis. So now I try to cook and eat fresh foods more often. I eat a lot of oatmeal, brown rice, vegetables, chicken and fish. I snack on popcorn, and nuts, and try to pick cereals that are low in sugar and high in fibre too. This way, I can just enjoy my KFC when I have it! I have a serious sweet tooth… I suffer from depression and anxiety, and stress-eat all the sweet things. I’m pretty sure that’s how I got myself into this mess in the first place. This has been a difficult change to make, because it’s a food habit that is tied to mental health issues. I’m learning to replace the my stress-eating habits with healthier habits, like taking time to read, listening to music, drawing etc. It’s an on-going process, but an important one too. My doctor had told me that since my pre-diabetes is related to my weight issues, losing even 5lbs could improve my blood sugar test results. I’m a petite woman, but I carry all of my weight in my stomach area (it’s genetics, sadly). This puts me at risk for Type 2 diabetes and heart disease, so it’s important for me to keep the weight off. From January 2017 – October 2018, I managed to lose 8 lbs and improve my A1C results. This was through a combination of having a physically demanding summer job in a garden centre, and adding cardio and weights to my exercise routine. That being said, we’re now in the dead of winter and I haven’t worked out in 2 months. Staying active can be a struggle, but it really does make a difference. My goal this year is to get back on track with my fitness routine, take care of my mental health, and maintain a healthy diet. It’s an on-going process, and if you’re struggling with any of these things too, I’m sure you know there’s no quick fix. A lot of this requires more effort than we always have energy for – but that’s ok. Just keep trying! I’m far from perfect, and I still make poor choices sometimes. I was definitely sipping on a coke as we waited for dinner (one of my weaknesses), and I split a slice of cheesecake with my mom for dessert (she ate most of it). It wasn’t even that good, and I knew it was too much sugar, but I ate it anyway. And I can acknowledge that and remind myself that I need to make better decisions moving forward. In terms of the blog, I’m still going to post desserts and sweets and recipes with carbs. But I’m also going to try harder to post more healthy, flavourful recipes that can be a part of a balanced diet. Not just because I need to do that for myself, but because I know there are lots of people out there who want to eat better too. 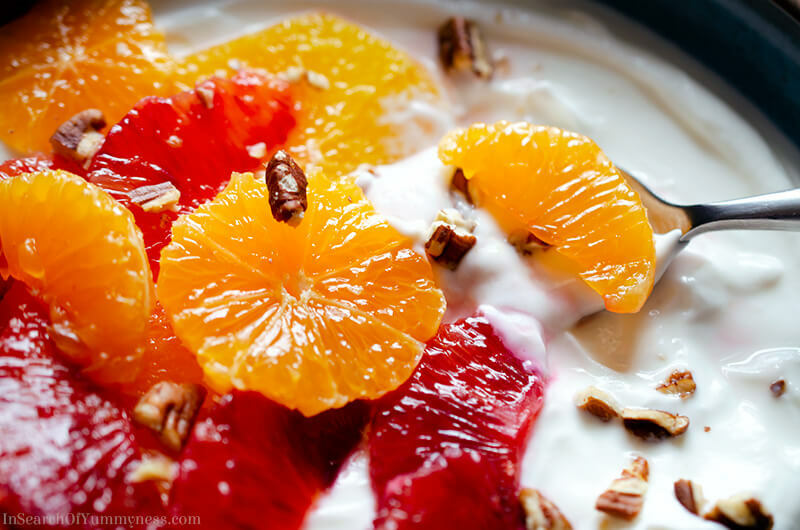 Hopefully this winter citrus yogurt bowl recipe helps both of us get off to a great start. 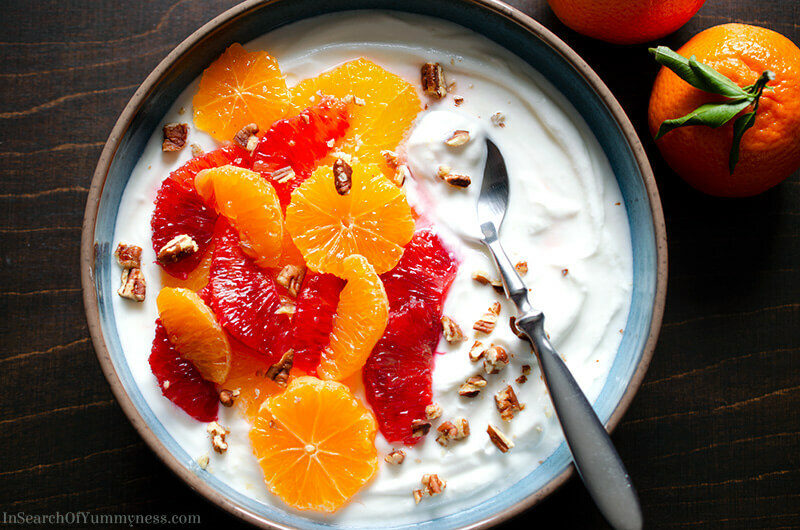 Add some brightness to your morning with this healthy winter citrus yogurt bowl. Place Greek yogurt in a bowl, and top with as much citrus fruit as desired. Top with toasted nuts, and enjoy. You top this winter citrus yogurt bowl with other nuts and seeds, or add granola, pomegranate seeds etc. This is not a sponsored post. I just really like Liberté’s yogurts.